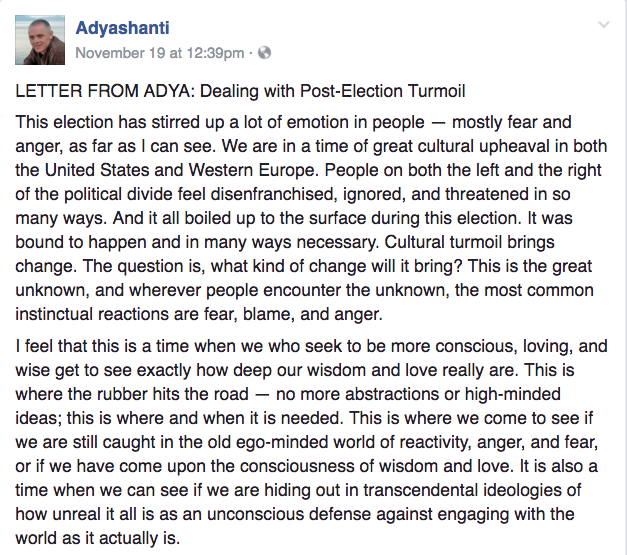 Spiritual teacher Adyashanti published the following Post-Election Letter to his Facebook page on November 19th. It was formatted as a caption to the photograph below. Since posting, it has been shared 1.7K times amongst his almost 57K followers. I don’t know how representative this is of the rest of Adyashanti’s work or writing. I don’t know whether it’s an uncharacteristic foray into politics. It might constitute a conscious shorthanding of complex issues for a social media format. But it’s a public letter on a platform of tens of thousands, addressed therefore to a broad spectrum of folks and experiences, so I’m responding to this (and this alone, being ignorant of his other work) as if it’s an important and influential document. Spotlighting emotions like fear and anger as fundamental problems to address, rather than the violence and oppression to which these emotions are responding. This amounts to a kind of spiritualized tone-policing that values civility and respectability over justice. Failing to show any awareness of how gendered, racial, and class privilege shapes and determines both the unequal consequences of political oppression and our unequal abilities to respond to it. By suggesting that everyone is responding to the same thing and from the same place, this language mirrors the propagandistic tool of false equivalency. In the campaign this was used to claim no difference between parties, or to focus on emails over admitted sexual assault. In these sermons, false equivalency is used to equalize the emotional responses of people in vastly different situations. 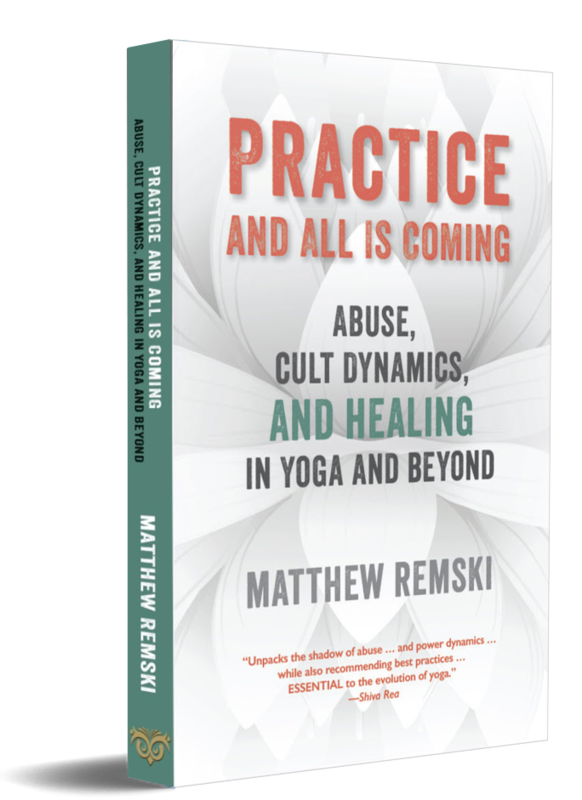 Pretending that spiritual language is neutral, and that vague appeals made to undefined values like love and wisdom are somehow the first step to addressing violence and injustice, and not the first step to actually ignoring violence and injustice. Vague and supposedly neutral spiritual language is essential for keeping a spiritual teacher’s usually depoliticized base of support intact. 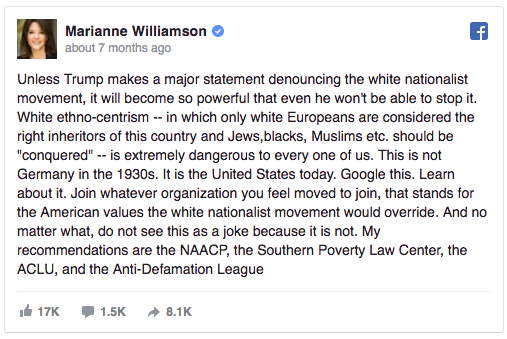 For an example of a (white, privileged) spiritual teacher who’s actually challenging this norm, check out what’s happening on Marianne Williamson’s page. She’s willing to lose hundreds of her it’s-all-good hardliners by the minute by taking a pretty basic stand on pretty basic issues. I’ll embed an example below. Fostering the notion that charisma is more important than content. And it all boiled up to the surface during this election. It was bound to happen and in many ways necessary. The question is, what kind of change will it bring? This is the great unknown, and wherever people encounter the unknown, the most common instinctual reactions are fear, blame, and anger. I feel that this is a time when we who seek to be more conscious, loving, and wise get to see exactly how deep our wisdom and love really are. This is where the rubber hits the road — no more abstractions or high-minded ideas; this is where and when it is needed. This is where we come to see if we are still caught in the old ego-minded world of reactivity, anger, and fear, or if we have come upon the consciousness of wisdom and love. It is also a time when we can see if we are hiding out in transcendental ideologies of how unreal it all is as an unconscious defense against engaging with the world as it actually is. 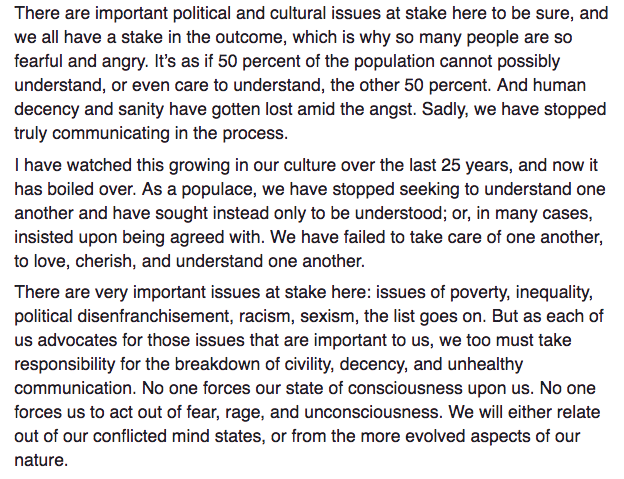 There are important political and cultural issues at stake here to be sure, and we all have a stake in the outcome, which is why so many people are so fearful and angry. It’s as if 50 percent of the population cannot possibly understand, or even care to understand, the other 50 percent. And human decency and sanity have gotten lost amid the angst. Sadly, we have stopped truly communicating in the process. I have watched this growing in our culture over the last 25 years and now it has boiled over. As a populace, we have stopped seeking to understand one another and have sought instead only to be understood; or, in many cases, insisted upon being agreed with. We have failed to take care of one another, to love, cherish, and understand one another. There are very important issues at stake here: issues of poverty, inequality, political disenfranchisement, racism, sexism, the list goes on. But as each of us advocates for those issues that are important to us, we too must take responsibility for the breakdown of civility, decency, and unhealthy communication. No one forces our state of consciousness upon us. No one forces us to act out of fear, rage, and unconsciousness. We will either relate out of our conflicted mind states, or from the more evolved aspects of our nature. The list that begins this graf ends with a rhetorical elipsis that affects boredom and hints at the unreality of the world. The second sentence pivots upon the subtle dismissal of material issues to turn the conversation back again to emotions and moods — again — as if the internal states generated by oppression etc. are as important as the oppression itself. The third sentence is a metaphysical speculation about the nature of consciousness, presented as if it’s scientifically true. “No one forces our state of consciousness upon us,” is, actually, demonstrably false. There are people responding to the electoral results from a history of PTSD, for example. Or women who have been raped who will now be tweeted at and governed by a confessed but unprosecuted sexual predator. States of consciousness can most definitely be forced by power and propaganda. It’s a mark of privilege to not understand this, or to deny this. Unless you’re going to claim that we are not subject to neurophysiological conditioning, maybe you can consider changing this. 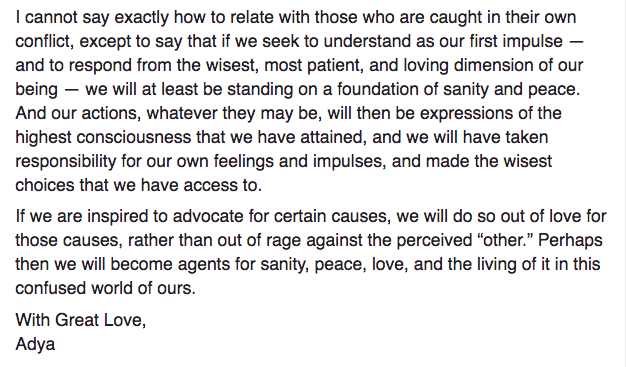 …except to say that if we seek to understand as our first impulse — and to respond from the wisest, most patient, and loving dimension of our being — we will at least be standing on a foundation of sanity and peace. And our actions, whatever they may be, will then be expressions of the highest consciousness that we have attained, and we will have taken responsibility for our own feelings and impulses, and made the wisest choices that we have access to. I feel that I do not wish to further divide us by getting all caught up in political debates. I say forgive them father for they know not what they do. I feel it is very important to me not to get into an us and them battle of words. It is not that I am sticking my head in the sand but rather that I choose to respond in love, peace, and understanding. Ram dass would say love everybody and tell the truth. Also, sometimes there is just not a good or immediate answer to all the problems before us. I choose to work on myself rather than finding fault with others. Though I am certainly not perfect or above a little sarcasm or frustration at times. And I deeply appreciate the ideas of awakened beings like Adya. Peace to you. I echo your words Lillian, thank-you. THANK YOU SO SO SO MUCH FOR THIS YES!!! 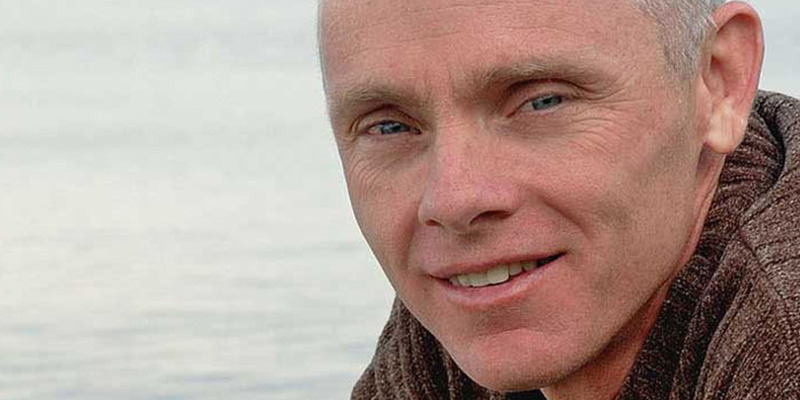 Not an Adyashanti fan, but you’re kind of proving his point. Just found your site via a Facebook thread. 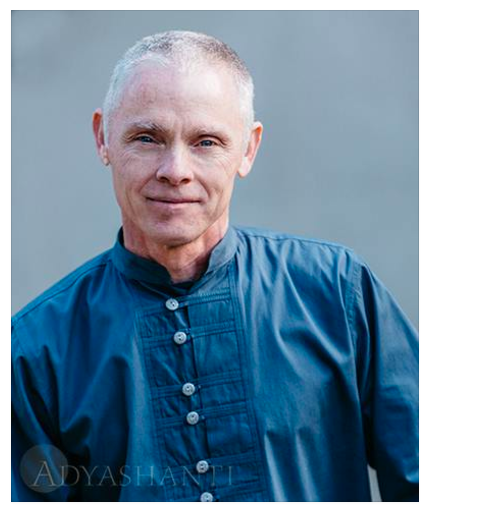 I saw Adyashanti being interviewed several years ago at a “Wake Up Festival” organized by Sounds True. Unlike most of the other presenters (and gurus) of that event, I felt like there was nobody at home in his body. Had he spiritually bypassed himself? I have a hard time understanding his appeal. Thank you for calling him out.